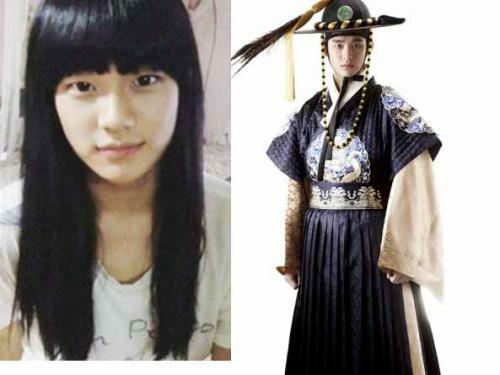 The photo of Kim Soo Hyun disguised as a woman revealed. On mid February 2012, the womanized photo of Kim Soo Hyun which he uploaded himself to his mini-blog was making the round on various community boards. When the photo of Kim Soo Hyun dressed as woman is compared with the role of Lee Hwon in The Moon Embracing the Sun that is full of charm, it immediately attracted everyone’s attention. In the photos, Kim Soo Hyun wore a wig. The fair skin and innocent look almost let people mistaken him as a girl. The appearance that is resembling Suzy who was co-starring with him in Dream High also attracted a lot of attention. Previously, although Kim Soo Hyun did not introduce who is in the photo when he uploaded the photo onto his mini-site, but netizens have guessed that it should be Kim Soo Hyun himself. After seeing the photos, netizens said, “Look once again, Kim Soo Hyun is really delicate and pretty,” “Kim Soo Hyun is very popular recently,” “Looks similar with Suzy,” “When is king very handsome, when in woman’s clothing very innocent,” and so on.